Giotto (1266–1337) and his workshop realized c. 1315 the large Crucifix now in the Louvre Museum. The conservation of this masterpiece in 2010–2013 in the C2RMF studios gave the opportunity for a comprehensive investigation of the execution technique through a characterization of the paint layers. The first examinations revealed an original gilding and decoration surrounding the Christ which was repainted during the 19th C., raising the question of the original decoration appearance. The original decoration still present underneath was unveiled. The different imaging analytical techniques applied brought complementary results allowing us to reconstruct the original decoration. 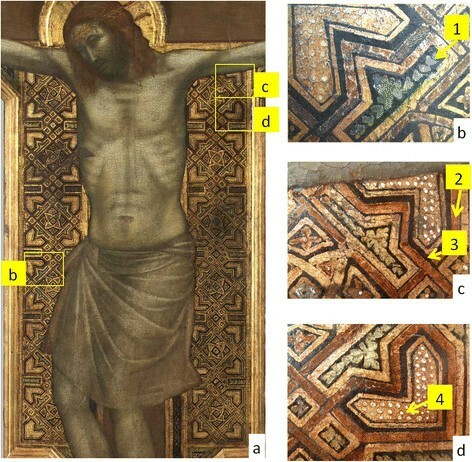 Elemental images of selected areas on the Crucifix were obtained using bi-dimensional X-ray fluorescence imaging technique (2D-XRF) with a prototype XRF spectrometer mounted on a motorized X-Y system. The head of the instrument was moved over a 150 x150 mm2 area with 1 mm steps, using a 1 mm beam spot and acquisition time of 2 seconds per pixel. The XRF spectra of each pixel provided semi-quantitative elemental maps of the layers: gilding and pigments even at low concentrations could be recognised. The XRF maps achieved were completed by X-ray radiographs and emissiographs of the Crucifix. Some micro-samples analyzed with the scanning electron microscope (SEM-EDX) allowed a better understanding of the stratigraphy. The comparison of the direct light and the X-ray pictures enabled us to distinguish the repaint from the original pattern. The visible metallic leaf is a thin gold leaf applied on a mordant gilding while the original one is a double leaf of gold and silver (Zwischgold) applied on a red bole. As for the painting, the visible decoration is composed of brown earth and organic greenish color whereas the original is made of red lake, copper green, azurite and vermillion. The 2D-XRF maps evidenced two levels of copper that could be ascribed to two different copper pigments, a blue and a green one. 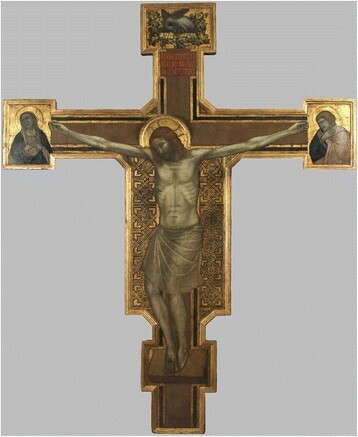 A complementary methodology combining classical X-ray imaging, sample analysis and 2D-XRF was applied to large areas of the Giotto’s crucifix. This approach allowed us to distinguish the underlying original composition from the 19th C. overpainted decoration. The Crucifix by Giotto and his workshop conserved at the Louvre museum (MI357) is one of the very few crosses conserved in a French museum. It was restored between 2010 and 2013 in the Centre de Recherche et de Restauration des Musées de France (C2RMF) for the exhibition dedicated to the artist held at the Louvre Museum in 2013 . The cross is 2.84 m high by 2.31 m width and made of poplar and pine wood (Figure 1). It stylistically follows an iconographic scheme established at the beginning of the 13th C. featuring decorated side fields with geometric patterns . Dominique Thiébaut, Louvre painting curator dated the crucifix ca. 1315 with an attribution to Giotto and his workshop . The Louvre Crucifix by Giotto and his workshop (MI357) (© C2RMF Gérard Dufrene). Prior to the conservation treatment, the painting was extensively documented by means of non-invasive methods, including photography (visible, UV and infrared imaging), infrared reflectography imaging, microscope examination, X-radiography and X-ray fluorescence analysis (XRF), in order to assess its conservation state. Examinations showed that the wood support is incomplete but original, while the frame surrounding the cross is modern. They also permitted to highlight presence of several pieces of canvas embedded in the ground on top of the wood panels. X-ray radiography and infrared reflectography imaging revealed underdrawings and incisions. 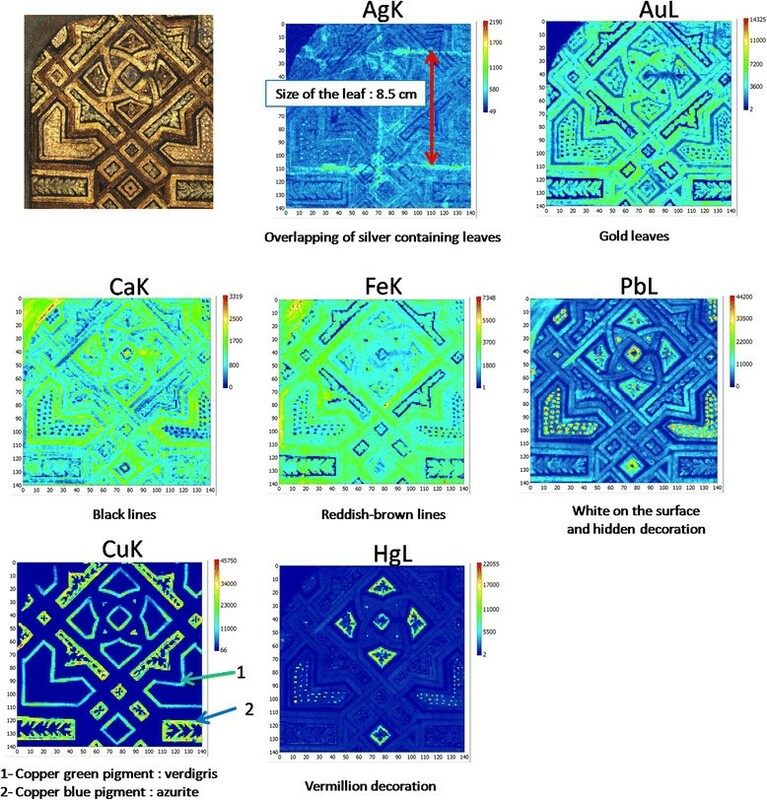 XRF allowed to identify pigments like lead white, vermilion, earth pigments, azurite and lead-tin yellow and the presence of gold and silver in the decorations . To complement these investigations, several micro samples collected during the conservation campaign and prepared in cross-sections were studied by scanning electron microscope with X-ray energy dispersive analysis (SEM -EDX). Organic components were not investigated. Early in the study, extensive repaints were evidenced, particularly in the decorations on both sides of the Christ (Figure 1). The analysis of some samples showed the presence of the original decoration beneath the 19th C. repaints. The aim of the present work is to determine the extent of the repaints and to unveil the original decoration patterns and materials of this masterpiece by combining different analytical techniques, especially the 2D-XRF imaging recently developed at the C2RMF. The investigation methods were applied to the entirety of the cross while the 2D-XRF, very time-consuming, was restricted to the areas presented here. The visible geometric decoration is composed of six elementary patterns of ca. 15 x 17 cm placed on both sides of the Christ (Figure 2a). On the gold leaf, the pattern shows a geometric base, with green and reddish-brown areas delimited by black lines and some white dots. During the study, we noticed that the reddish-brown layer stops surprisingly at the crossing of the interlacing and that the green decoration presents an unusually transparent and pale aspect (Figures 2b, c, d). Micro samples were then taken in these areas (Figures 2b, c) for SEM-EDX analysis. The results showed that the reddish-brown layer is composed of earth pigments, whereas the green glaze, unlike often seen in old paintings, is not a copper green but an organic matter. a) decorated side fields with geometric patterns. b) c) and d) Samples locations: the green glaze (1), in a reddish-brown area (2), in a black area (3), in the uncovered gilded area (4). Optical microscope observations of the cross-sections reveal that the decorated side fields are composed of two overlapping compositions. In the sample taken from the gold leaf in the corner of the pattern (Figure 2d), two painting execution phases could be demonstrated as can be seen in Figure 3. The dotted red line figures the interface between the original layers and the repaint. The bottom layers correspond to the original composition and the upper layers to the repaint. At the interface, a layer rich in medium is present (layer 4), probably applied during the repainting. The sequence of the repainted layers is the following: under the varnish layer (layer 7), a gold leaf (layer 6), on top of a yellow-orange layer (layer 5) relatively rich in binder which corresponds to a gilding mordant used to fix the gold leaf. The SEM-EDX analyses of the latter show the presence of lead and surprisingly also chromium. This likely indicates the use of chrome yellow, a lead chromate pigment introduced in the early 19th C., providing in this way a clue to date the undocumented intervention before the Cross came to the Louvre collections in 1863. Optical micrograph of the cross-section from the gold leaf in the decorated side fields. The dotted red line figures the interface between the original layers and the repaint. gesso ground (1) red bole (2), Zwischgold leaf (3), thin organic layer (4), orange gilding mordant containing chrome yellow (5), 19th gold leaf (6) and top varnish (7). (© C2RMF Myriam Eveno). 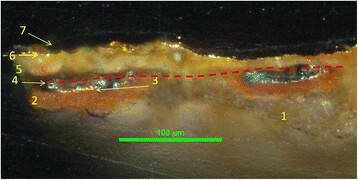 In the lower part of the cross section (Figure 3), the original painting appears composed of a conventional gesso ground (layer 1) covered by a red layer of bole made of earth pigments (layer 2) beneath a metallic leaf (layer 3). As can be seen in this cross section, these layers are now fragmented, indicating a worn paint layer. The cross section was ion polished for a finer examination using a scanning electron microscope with field emission gun (SEM-FEG) (Figure 4). The original metallic leaf turned out to be a silver gilded foil known as Zwischgold or “parti-gold” . Zwischgold is made of two thin sheets of gold and silver hammered together and used in place of gold leaf, possibly for economical reasons. The drawback is the undesirable trend to tarnish. Figure 4a on the left shows the very thin (below 200 nm) modern gold leaf; Figure 4b on the right shows the Zwischgold leaf composed of a gold layer of ca. 100 nm on top of a silver layer of ca. 600 nm. The silver is today altered into silver chloride. Alteration of the Zwischgold layer was probably the motivation for repainting the decorated side fields. SEM-FEG secondary electron images of the two gildings. a shows the modern leaf with a ca 200 nm thickness. b shows the Zwischgold leaf composed of a 100 nm Au layer on top of a 600 nm Ag layer. The latter has turned into silver chloride. Aggregates on top of the gold layer are made of the same material and come from the altered layer (© C2RMF Patrice Lehuédé). Four cross-sections have been taken in the various areas of the decoration: in the green glaze (1 in Figure 2b), in a reddish-brown area (2 in Figure 2c), in a black area (3 in Figure 2c), and in the uncovered gilded area (4 in Figure 2d). In all samples the original ground, red bole and the Zwischgold leafs are covered by the 19th C. gilding, except for the sample taken in the black line, where the Zwischgold is not covered. This observation is important for the understanding of the applied repainting process, and discussed below. Under the black layer composed mainly of earth pigments and bone black, the SEM-EDX analysis showed the presence of a green layer containing copper, likely verdigris. 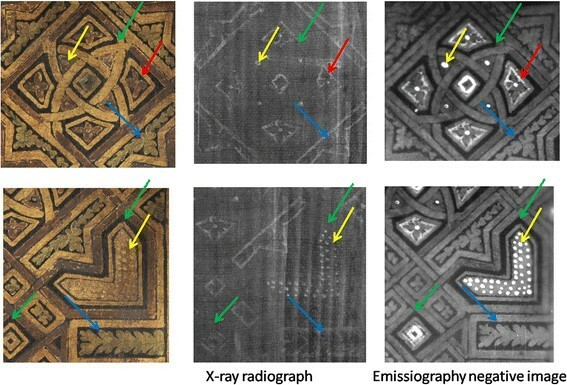 The X-ray radiography and electron emission radiography images provide a first view of the original pattern. On the radiograph, white areas correspond to high X-ray absorption while on the negative emissiography image (reversed to facilitate interpretations) white areas correspond to high electron emission. The comparison of the contrast in the X-ray images brings additional information with respect to the visible image. Figure 5 shows two details of the decoration pattern, with corresponding radiograph and emissiograph. Areas containing light hues in the visible pattern (white or grey) like the white dots in the center of the triangles or the small dots in the corners (yellow arrow) present a strong opacity in the radiograph and a strong electron emission. The X-ray images correspond here to the visible pattern, and the pigments contain heavy elements. It is not the case of the dark lines of the visible pattern that exhibit three different behaviors in X-ray images. First, black motives surrounding the four flowers in the central pattern show a strong opacity in radiograph and a strong electron emission (red arrow). In X-ray images these motives appear more finely drawn and thinner than in the visible design. These areas correspond thus to a hidden decoration containing a pigment with heavy elements. Secondly, the black lines surrounding the green foliage strongly absorb X-rays but do not emit electrons (blue arrow). Such a behavior corresponds to a hidden and rather thick pigment layer containing elements of intermediate atomic number. Finally, the black lines surrounding the four corner patterns are invisible in the radiographs and do not emit electrons (green arrow). The pigment is probably made of low or intermediate atomic number elements. To sum up, a grey scale image shows a distinct response in X-ray images reflecting the presence of various pigments (Figure 6). Two details of the decoration pattern, with corresponding radiograph and negative emissiograph. Yellow arrows: areas presenting a strong opacity in the radiograph and a strong electron emission and corresponding to the visible pattern; Red arrows: areas presenting a strong opacity in radiograph and a strong electron emission and corresponding to a visible black pattern; blue arrows: areas presenting an absorption of X-rays but do not emit electrons and corresponding to a visible black pattern; green arrows: corresponding to visible black lines invisible in the radiographs and in the emissiograph. Grey scale image showing the different response in the X-ray images reflecting the presence of various pigments. In particular, the black visible lines produce 3 different answers. (© C2RMF Elisabeth Ravaud). These X-ray images revealed several features of the patterns. The visible one closely follows the hidden original one and no additional elements have been observed. As for the hidden motives, flowers and narrow lines appear more finely designed and the decoration under the visible black lines was painted with three distinct materials. The 2D-XRF imaging technique was applied in view to precise the nature of pigments. The most significant elemental maps of the scanned area are presented in Figure 7 where the false colours scales represent the counts for each element. visible pattern and Ag Au Ca Fe Pb Cu Hg elemental maps of the scanned area. The silver map shows the presence of silver from the original Zwischgold. The areas with higher intensity correspond to an overlapping of the square foils of 8.5 cm wide. As can be seen in the gold map, the gilding covers a large part of the pattern. It is however impossible to distinguish between the original and the 19th C. gildings. Few areas produce a low gold response, appearing in blue. They correspond to three situations: the Au X-rays of the original underlying foil are absorbed by an overlapping original paint layer (likely copper-based pigments), the modern foil gold signal is attenuated by the overlying lead white motif (white dots in corners), the gold foil was not applied (e.g. on the copper motif). Calcium seems correlated to the visible black lines, probably coming from bone black. Iron is correlated to reddish-brown lines of the repainted decoration, corresponding to earth pigments. Lead, coming from lead white is correlated with the white dots of the repainted decoration and also with the original flowers in the centre of the pattern. The copper map is particularly informative, as it shows two intensity levels that were ascribed to two distinct copper-based pigments (Cu levels < 2000 counts and > 2000 counts, respectively). The first one, corresponding to the lower level, is a pigment of green colour that was previously evidenced under the black line in a cross section taken from the corner which likely corresponds to verdigris. The full identification of the pigment would have required complementary analysis, such as FTIR. The second one, corresponding to higher copper contents, was found near the foliage, and identified as azurite, since a blue pigment was observed by optical microscopy in cracks in this area. Azurite was also identified by SEM-EDX in a cross-section taken from another area (under the arm of the Christ). These lines now repainted in black were originally green and blue, respectively. The two pigments correspond to the ones with intermediate atomic number discussed above (pigments labelled 1 and 2 in Figure 7). Mercury map corresponds to a vermillion decoration. The contour of the flower was thus originally lined with red and not black as repainted today. The dots appearing in corners are an experimental artifact corresponding to a ghost image of the lead map induced by an excessive count rate (Figure 7). The combination of the previous results allows us to propose a reconstruction of the original pattern painted with copper green, azurite, vermillion and lead white (Figure 8b). Some important features of the original decoration, such as the interlacing pattern are however missing from this scheme. Indeed, interlaced gilded lines were the core of the 14th C. geometric decorations, as testified by two other Crucifix painted by Giotto, the Cross from San Felice in Piazza in Florence (1308–10)  and the Cross from the Scrovegni Chapel in Padua (1303–05) . a: visible pattern; b: reconstruction of the original pattern painted with copper green, azurite, vermillion and white lead; 8c: reconstruction of the original pattern with additional red glazed interlacing (© C2RMF). The presence of red lake was evidenced through microscope examinations, in particular in cracks. Red lake locations were estimated on the basis of these observations and of cross-sections results. Through the combination of the red glaze interlacing pattern and the previous results on inorganic materials (Figure 8b), a reconstruction of the original decoration might be suggested (Figure 8c). One important conclusion is that the original interlacings strongly differ from the present one. The regions represented in red in Figure 8c appear in gold on the visible image and vice versa. Moreover, this interpretation avoids the clumsy interruption of the visible reddish-brown interlacings. Of course, details too small to be imaged and additional organic materials undetectable with the techniques employed could have been omitted in our proposition. The present study relies on an integrated experimental approach combining several imaging techniques at microscopic and macroscopic scales, ranging from optical and electron microscopy to X-ray and elemental imagings. The principle, implementation and performances of the various techniques employed are reviewed by M. Alfeld . The SEM analyses have been carried out using the scanning electron microscope Philips XL30 (20 kV), equipped with the energy-dispersive X-ray detector from Oxford Instruments. Data were acquired and processed using the INCA software. The cross-sections were embedded in resin, cut, polished and coated with carbon. The SEM-FEG images have been obtained using the scanning electron microscope Jeol JSM-7800 F operated at 5 kV. To improve image quality, cross-sections were argon ion polished  and coated with platinum/iridium. X-ray radiography is an imaging technique based on the absorption of X-ray beam by matter. The absorption increases with both the thickness of the target and the atomic number of the constituent elements. The operational conditions employed in the present study were 40 kV, 5 mA, 2 mn. In contrast, electron emission radiography, also named emissiography is an imaging technique based on the emission of secondary electrons induced by a high energy X-ray beam ,. Figure 9 depicts the emissiography experimental setup employed. The sensitive film is placed in close contact on top of the paint layer. The high energy X-ray beam produced by the generator at 290 keV, 4 mA, is filtered using a 8-mm copper foil to absorb the soft X-rays to prevent the darkening of the film by the direct beam. The constituent atoms of the paint layer are ionized by this high energy beam and the emitted electrons impress the film during 2.1 min. Since electrons only travel a limited range (less than 100 microns depending of the material), the obtained image pertains only to the paint layers at the surface and not to the substrate. These specifications makes emissiography especially useful in the study of paintworks applied on a thick support or on top of a thick lead-containing ground. Emissiography experimental setup. (© C2RMF Elisabeth Ravaud). Scanning X-ray fluorescence imaging of paintings, labelled here 2D-XRF, was initially developed using synchrotron radiation . This technique has recently been adapted to the study in situ by using laboratory X-ray generators ,. 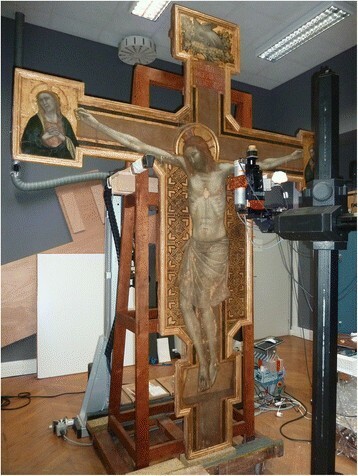 The 2D-XRF imaging of the cross was carried out with a prototype designed at the C2RMF (Figure 10). The instrument records elemental distribution images by scanning the instrument head in front of the panel using a motorized X-Y stage. The head integrates a 50-kV molybdenum X-ray generator that produces a 1 mm beam spot on the painting and a fast-counting silicon drift detector to collect the X-rays emitted by the irradiated point. In our case, the images of 140 x 140 mm were acquired with a step size of 1 mm, 40 kV and 0.2 mA with a count rate reaching up to 40 K counts/sec. View of the 2D-XRF setup in front of the crucifix. (© C2RMF Myriam Eveno). The system records a full spectrum at each point every two seconds. The total acquisition time of an image is about 21 hours. The XRF spectrum of each pixel is processed with the PYMCA program developed by the synchrotron community . It allows to generate fitted peak area maps for different elements. The processing of an image takes about a quarter of an hour and produces semi-quantitative elemental maps for various elements (K, Ca, Mn, Fe, Cu, Au, Hg, Pb). The elemental distribution images are visualized using a home-made program called DataImaging 3D . Combination of various scientific imaging techniques provided a precise picture of the hidden decorative side fields of the Crucifix from the Louvre museum. The results achieved by these analytical techniques, all performed at the C2RMF and fully complementary, bring to light that the original composition was repainted in the first half of the 19th C.
The first and invisible composition is composed of a Zwischgold gilding applied on a red bole, on which a geometric decoration was applied using bright pigments such as azurite, vermillion, verdigris, lead white and red glaze. The 19th C. repainting was executed with a restricted palette, containing earth pigments, organic green, bone black applied on a gold foil attached to a gilding mordant containing chromium. The visible patterns generally follow the original ones which appear to be more refined. The very close similarity of the shapes and the use of a gilding mordant for the repaint allow us to understand the employed technique. A gilding mordant layer was applied following and skirting the original pattern on which pieces of gold leaves were deposited, enabling to reproduce the previous design. The original green, blue and red patterns were subsequently repainted in black. Interlacings first painted in red glaze were awkwardly reproduced in red-brown and the blue foliage repainted in pale green and white dots added to the composition. The knowledge of original and repainted colours provided by this study gives us a better insight of the extensive repaint. The fact that the brilliant original colours were covered by black lines could be due to alteration. The browning of copper pigments is a well known process, so as the blackening of vermillion which was also observed in other parts of the cross and the degradation of the silver contained in the Zwischgold. Thus, the entire decorative side fields might have turned dark with time and motivated its repainting. The colours selected for this intervention might be a misunderstanding and merely reflect the degraded state of the original materials. Considering the bad conservation state of the original composition, in particular of the silver degradation of the Zwischgold, the repaint was not removed during the restoration treatment. The materials identified in the original composition, in particular the azurite pigment instead of lapis lazuli and the gilding in Zwischgold instead of pure gold testify the modest status of this artwork in comparison with other Giotto Crosses, such as the crucifix of the Santa Maria Novella . For this reason, the Louvre cross is attributed to Giotto’s workshop under the master supervision . We thank Rosaria Motta and Claudia Sindaco, in charge of the conservation treatment undertaken in the C2RMF studio from 2010 to 2013, for their precious observations and valuable discussions. We are grateful to Thiphaine Fabris and Daniel Abriou for the ion polishing preparation of the painting cross-sections at Saint-Gobain research EMC2 laboratory and Patrice Lehuédé for the SEM-FEG examinations. We warmly thank Dominique Thiébaut curator of the Louvre museum for having initiated and encouraged the study of Giotto’s cross. We are indebted to Vincent Pomarède director of the Louvre painting department for his constant support. ME prepared the cross sections, performed analytical measurements by SEM-EDX and interpreted the data. ER performed and interpreted X-ray imaging and studied the art history context. TC and LP developed the 2D-XRF spectrometer. TC LP and EL performed the analytical measurements. ME, ER and TC wrote the manuscript. All authors read and approved the final manuscript.